Finish Jet-Dry Rinse Agent fights spots and residues for a Diamond Shine. With detergents alone, food and chemical residues can redeposit on dishware during the rinse cycle, causing spots and residues to remain. 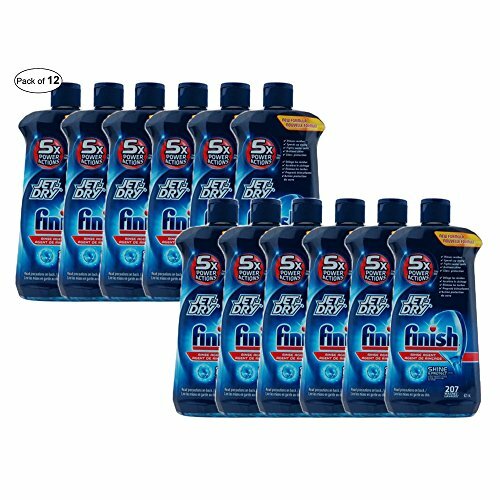 Add Finish Jet-Dry Rinse Agent to rinse away leftover food and detergent residues for sparkling dishes, glasses and cutlery. Simply fill your rinse agent dispenser with Finish Jet-Dry Rinse Agent and it will be automatically released in the rinse cycle every time your dishwasher runs. Superior spot and residue protection vs. detergent alone. Dries, Shines, Fights Spots, and Fights Filming. 207 washes in one bottle. Weight : 0.747 kg , Dimensions : 10 x 6 x 22 cm. If you have any questions about this product by FINISH ®, contact us by completing and submitting the form below. If you are looking for a specif part number, please include it with your message.